Discussion in 'Downhill & Freeride' started by Drth Vadr, May 29, 2012. I pretty much decided on one of the two tires, but would like some feedback from anyone thats been on both tires. I'm also interested in wear and roll characteristics. i used the Butcher SX for half a season. they are ok in wear. Gripwise better then most too. This is exactly why I ask. One review says Butcher's are squirrelly and wear fast and another says the opposite. The Clutch has faired a little better with consistent reviews, but I can't figure if it's better as a front or a rear. Lean toward Butcher SX front and Clutch SX rear, but would like to know if anyone running this. i ran the clutch 2.3 front, purgatory 2.2 rear, worked out quite nicely. the clutch has wide open, square knobs whereas the purgatory has a more full tread as well as those angled knobs, makes for better rolling/pedaling traction. i'm running a butcher control fr and clutch control rr on my trail bike. i definitely like the butcher over the clutch as a fr tire - better cornering, more predictable. the clutch on the rr works great, but i haven't run the butcher in the rr so i can't compare. I will have to double check, but I think I am running a clutch on the front of my XC bike, it seems ok in sandy/hardpack/mud we have on our XC trails here locally. I haven't really used them on my DH bike other than one day over a year ago in the sand. Well the Chunder is discontinued, so that should reduce the confusion somewhat. Otherwise, keep in mind that the Butcher, Clutch, and Chunder were not developed to cover different conditions. They were designed as successions of each other, not compliments to each other. The Clutch was designed as a true do-it-all DH tire. It has some features of a faster race oriented tire, and some features from trail tires. It tends to do well in a variety of conditions, while sacrificing some performance compared to a dedicated condition tire. The Butcher was developed to be a race tire first and foremost. It's meant to be ridden fast. We didn't put in the same features that make the Clutch a little better at slow/techy stuff. Neither tire is designed as front or rear. I can't think of any good reason to mix and match. If you prefer one tire due to your riding style, I'd rock it front and rear. I double checked, I am riding a chunder up front. I don't know that I would love it as a full on DH tire. I had the butchers on my AM bike and they were great , hooked up well , rolled fast, and were predictable .. You have to really lean them to make them bite . The clutch rolls slower then the butcher, and its got a slightly mushier edge then the butcher. Grips pretty damn well though, and the sidewalls are great. I'd go with the butcher if you're confident about corners, and the clutch if you have a harder time trusting your tires grips, like if you're in lose conditions. I have very little mud experience with them though. I enjoy riding in loose conditions, and prefer going out after a over night rain shower. That is one reason I loved the Rubber Queen on the AM bike. All my riding will not take place at a resort with well maintained berms, so some off camber stuff is a concern. One of my riding destinations this summer is very rocky and technical. I run two butchers, for the same reason I used to run to Minion DHF, almost the same tyre. Where's the 60d burly (IE sx) tubeless butcher? PS - Would have been better if they called it Mag 21! I agree, other than the part about conditions. The Clutch has some pretty thick sideknobs, which tend to give a ton of support on harder pack terrain but don't dig in quite as well in loose dusty conditions. The Butcher has slightly thinner and longer sideknobs which dig in very well in loose stuff but can feel squirmy if you are railing hardpack berms all day. Keep in mind that the DH and SX versions have applied different rubber compounds, so they will probably feel pretty different. Brendog&#8217;s favorite tire caused a little disappointment among the Mag41 test-crew during its first test ride under wet conditions. We asked ourselves how to interpret the name &#8220;Butcher&#8221; by Specialized. Butcher, meaning the right choice for every massacre on the hardest tracks? Or meaning a precise dissector working extremely picky? Let&#8217;s start right at the beginning. The extremely regular tread, with center and side knobs forming one line, doesn&#8217;t grip very well on wet roots and rocks. In combination with the moderate self-damping, a little more precision and riding stability would be something to wish for. Off camber is not the Butcher&#8217;s specialty either. Becoming a vegetarian as a result is however a little over the top. The Butcher definitely knows how to win over on dry tracks by vanishing any fears of dry and rocky sections and patches of roots. At high speed however, it tends to bounce a little, due to the previously mentioned average self-damping. On hardpack and in narrow curves the Butcher is one of the fast tires, thanks to its smooth handling. In the end, no one of the test riders really figured a suitable interpretation for the name &#8220;Butcher&#8221;. One thing is definitely obvious though: the tire is &#8220;specialized&#8221; for dry, rather pedaling-intensive tracks! Top-notch puncture resistance! After an additional test with countless runs on the rocky tracks of Bad Wildbad under totally dry conditions we had not one single flat tire. Laboratory findings confirm this. 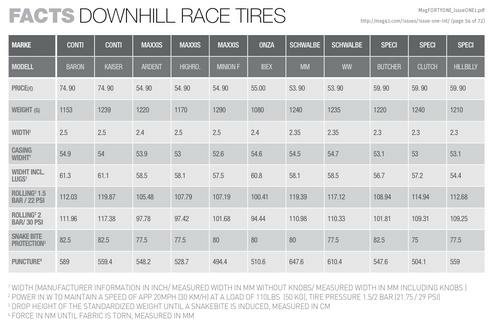 Specialized&#8216;s all-round tire distances itself from the other all-rounders like Maxxis HighRoller, Continental Baron or Schwalbe Muddy Mary already in its tread profile. Closely arranged knobs might remind you of the Minion Front. Indeed the Clutch is similar regarding the riding performance in the practical tests. The tire doesn&#8217;t really like wet tracks and it seems as if the rubber compound refuses to grip properly. On dry surfaces it has good handling properties and is always predictable, thanks to its clearly defined limits in curves. Similar to its siblings Butcher and Hillbilly, missing superior self-damping causes some bounciness. That&#8217;s why the tire is not entirely stable at high speed. The slightly offset and thick side lugs grip well off camber. The center lugs offer an additional braking edge, which is however hardly even noticed. But generally speaking, the braking performance is very good. Measurements of the rolling resistance show only average results in contrast to the quite satisfying physical feedback on the trail. On both hardpack and soft grounds, the Clutch is a speedy companion. To sum it up it seems like Specialized tires were designed for the Californian sun, rather than the European climate. Whilst offering only average grip on wet ground, they clearly know how to persuade in dry conditions. I have had both Butcher and Clutch SX tires. I'd NEVER use the Butcher SX on the rear, the sideknobs are way too soft, they fold over and wear super fast. In fact, I started a thread asking of there was something wrong with the Butcher SX's rubber compound. The Clutch SX makes for a much better rear tire than the Butcher, although I'd try the Butcher on the front. IMO the DH version of the Butcher is FAR superior to the SX version because it is supported by a 70a baselayer, I run the Butcher DH front and back on my dh bike and they are the best overall dh tire I have ever used. The differences are HUGE. Dh version is far better, rolls much faster and lasts much longer. DH version, yes. SX version, NO. Better version here - click for big!